This season of Black-ish has been a mixed bag. It featured excellent episodes like “Lemons” and “Being Bow-racial,” while also giving us muddled episodes like “Richard Youngsta.” Naturally, this season was going to be more political given the state of the world right now, but it’s fair to say that season three of Black-ish tried to do too much. When you really think about everything the show had to balance this season, it’s commendable: Bow’s pregnancy, Zoey’s spin-off, maturing Jack, Diane and Junior in Zoey’s absence, guest appearances and navigating topical political moments. Issues like colorism and black rage were handled beautifully, but the show was less successful when it came to addressing black women in the workplace or representations of black people in the media. Combine that with Bow’s never-ending pregnancy and the random disappearances and reappearances from Pops and Ruby and you get a season that, overall, feels oddly paced. “Sprinkles” is a finale that shares a lot of these problems, but it does remind us of what Black-ish was trying to accomplish this year. It’s a finale that makes me excited for next season, but mostly because it feels like the narrative that was set up all season is just getting started. For an episode that features Bow going into emergency labor and the introduction of the new Johnson son, it actually lacks any real urgency. The first half of the episode is dedicated to Dre planning a co-ed baby shower. Perhaps, co-ed baby showers are a big deal right now––I have no idea. But, the show sets up this premise with the same educational Dre monologue it typically uses to introduce important historical themes or cultural issues. Yet, as far as anyone can tell, the importance of co-ed baby showers is just Dre’s desire to drink beer and eat tacos at them. That would be perfectly fine if the episode didn’t spend so much time on the topic. The show teased Bow’s birth. It was unlikely that they would end the season without her giving birth, so it just feels unnecessary to prolong the inevitable for something so superficial. 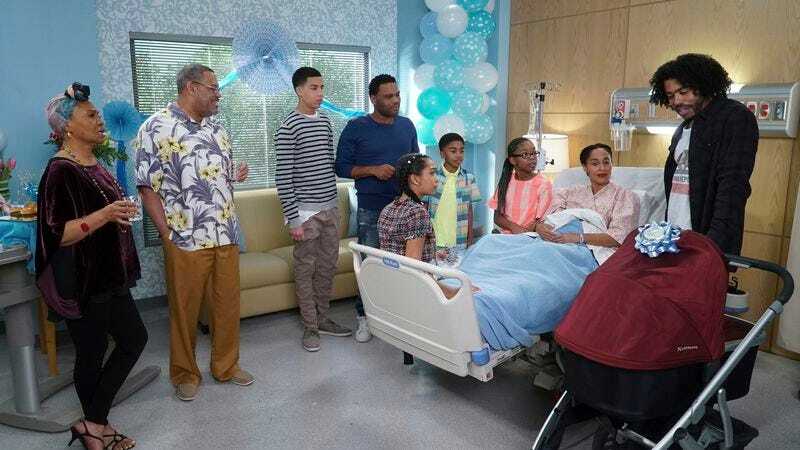 Black-ish can definitely pull off heartbreaking moments––this season’s “God”, where the family anxiously waits to hear the baby’s heartbeat is one of the show’s best moments. “Sprinkles” doesn’t quite get there. Anthony Anderson’s performance is among his best as he realizes the gravity of the situation, but the entire thing just feels rushed. The episode goes from asking if Bow has a DNR signed to her emergency C-section. The Johnson kids mostly sit things out as they plan gift ideas for the baby and spend most of their time in the emergency room. The actors on Black-ish are among the strongest on TV and “Sprinkles” would’ve benefited from letting them marinate in such an urgent situation. This is evident in the episode’s strongest moment. Bow is left in a hospital hallway, shivering. Ruby comes over and is immediately concerned. She demands a blanket for her “daughter.” Then they both realize it’s the first time she’s ever done that. Of course, Ruby plays it off, but the moment clearly means something to Bow and their growing relationship. Tracee Ellis Ross and Jenifer Lewis are amazing together and their brief scene was a perfect example of the show’s emotional achievements. Dre’s insecurities around the baby’s fragility and illness also would’ve played better if the actual birth had been more connected to the other Johnson children. Pops and Dre have had great moments together on the show, but Pops’ pep talk didn’t quite land. A moment between Dre, his children and their new family member could’ve provided more reassurance around Dre’s abilities as a father, but the episode only hints at this dynamic. Instead, we get a joke from the oddly present Charlie about his mother being reincarnated as the baby. The episode’s ending also feels rushed. While it’s a joyous occasion and it’s great to see the family together, Biz Markie’s appearance just feels shoehorned into the events. Maybe things felt off because Eva Longoria directed this episode (…no, I don’t know why either). Maybe changes in the season’s episode order affected the finale. Either way, “Sprinkles” isn’t Black-ish’s best finale because it doesn’t feel like a finale. It sets us up for open possibilities when the show returns. But if “Sprinkles” had aired a little earlier this season, it would’ve given a dense season a little breathing room. We finally got a BRIEF Charlie and Diane moment. I’m happy to see their rivalry still exists, but it would’ve been great earlier in the season. Similar to “Liberal Arts,” Charlie feels unnecessary here. The circumstances of his mother’s bathtub shark bite are hilarious enough, but y’know…some things can just be about the Johnson family. Charlie’s mom has lived through the dawn of flight and the death of Circuit City. I have even more questions about his age. Thanks for hanging out this season! I’ll definitely miss checking in with the Johnson family and Charlie every week.